This strip is a reply to Tutorial: Building A Character - Part 1, SG for DUMMIES Contest!, Gorilla kit, some assembly required. Adding eyes and expression to your character. In part 1, we created our basic face. Now to make use of all that masking we did. Let's create an eye. Start with a squashed white circle, slightly smaller red, and another smaller white. Work with large shapes - you can reduce the whole thing later. Set the red opacity to 30 and the blur to 10. Set the top white circle to blur 20. 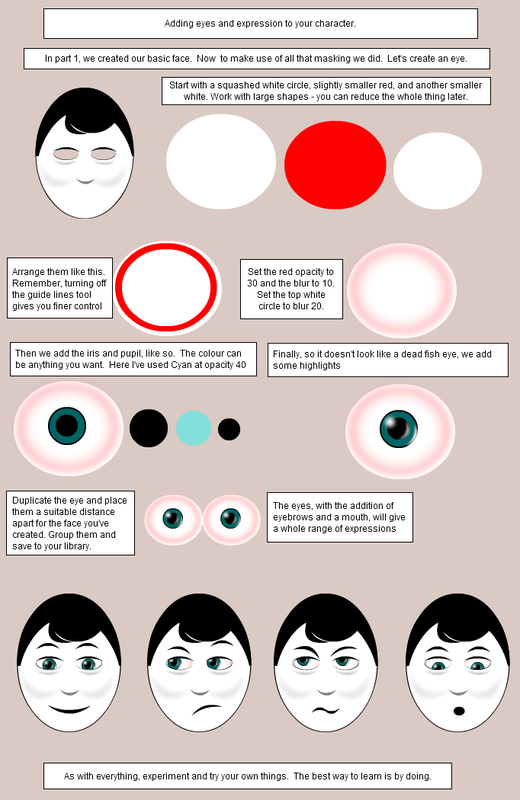 Duplicate the eye and place them a suitable distance apart for the face you've created. Group them and save to your library. As with everything, experiment and try your own things. The best way to learn is by doing. the last four are so expressive! GREAT tutorial! Real helpful to many! another good tip - THKS!! !